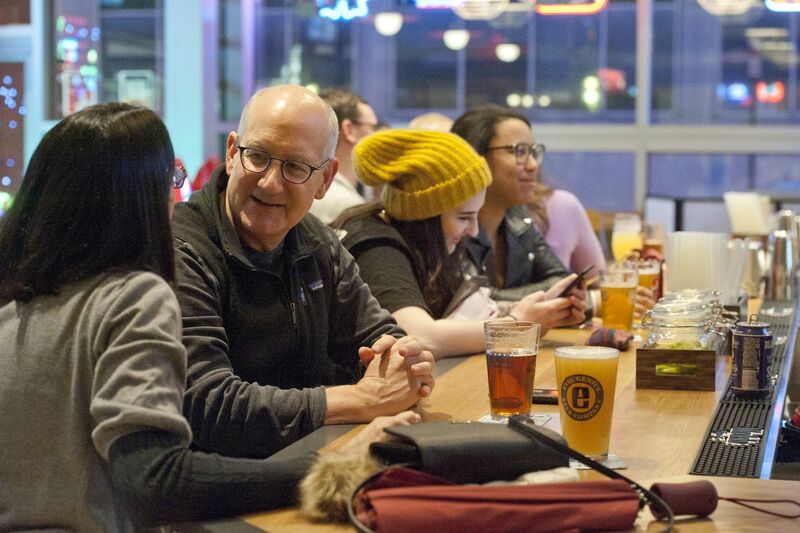 Patrons enjoy good drink and conversation at the bar of the The Post at Cira Garage in West Philadelphia, February 23, 2019. A not-unpleasant sense of déjà vu washes over me as I pull up a bar stool at the Post, a new beer hall that’s set up camp in the bleak no-man’s-land between Center City and West Philadelphia that has, in the last few years, become home to some of the city’s most ambitious new mega-developments. Maybe it’s due to all the throwbacks — the sliders on the menu, Gin Blossoms and Wallflowers on the sound system. Or maybe it’s just that this trope has grown well-worn in Philly in recent years: the promise of cold beer, loud music, echoey concrete spaces, and roll-up glass garage doors, like at Frankford Hall in Fishtown, Victory Beer Hall in South Philly, and Garage in both Fishtown and South Philly. The Bourse is actually Philly’s biggest, most ambitious bar. Will it survive? Food offerings (and free table games) at The Post. McRill says he created the concept in response to what he thought the area needed. As I make my way down the silent, deserted block of 30th Street, I can confirm it definitely needs something. Cira Centre South's parking garage on 30th Street near Chestnut Street houses The Post, a beer hall. The Post is on the ground floor of a parking garage — a fact I never really forget during my visit. Inside, during what passes for happy hour ($5 beers, ranging from Bud Light to a guava IPA from Philly favorite Evil Genius, aren’t exactly a steal), I find a thin crowd at the bar. The long wooden picnic tables are scattered with the type of motley, slightly uncomfortable-looking groups that tend to arise when coworkers feel obligated to go out for drinks together. But the Post has promise, including all the requisite ingredients for a playground for twentysomethings in backward baseball caps: flat-screen TVs, Skee-ball courts, vintage arcade games, shuffleboard courts, board games like the intentionally offensive Cards Against Humanity, $3 Miller High Life bottles, $5 Twisted Tea, and $6 well drinks. It’s true that ordering food is a slight hassle. (The bartender sends me over to order at a window, where I suddenly feel the need to convince the bored-looking cashier to both acknowledge my existence and take my order. “How’s it going?” I attempt, by way of an opener. “About how it looks,” he responds, shutting it down.) However, what comes out of the kitchen is solid: a respectable pulled-chicken slider; a freshly whipped hummus plate with crisp vegetables and soft pita bread; a heaping plate of crisp, salty fried pickle chips with smoked pepper mayo. Matt Adams of South Philadelphia plays table shuffleboard at The Post. When to go: This is a highly programmed space, with Quizzo, shuffleboard tournaments, live music, and DJ sets. Check social media for details. It opens at 11:30 a.m. for lunch and weekend brunch, and closes at midnight Sunday through Thursday, and 2 a.m. on weekends. Bring: Your office party. With 7,000 square feet, there’s plenty of space to spread out. What to order: A pile of barbecue chicken sliders (three for $8) and a heap of pickle fries ($6) for the table, and a pint of local IPA from Levante, Victory, or Dogfish Head ($6 to $8). Bathroom situation: Private rooms, not stalls, that are not notably clean or particularly dirty. Sounds like: A calm 80 decibels of ’90s alt-rock in the early evening, getting progressively louder and more current as the night wears on. The bar at the Post.